One of the most hyped games of the year, Yooka-Laylee is the collect-a-thon platform we’ve needed for years. Ever since its announcement in 2015, the game has garnered a great amount of attention for its retro style and talented team. And, with the game finally released on Nintendo Switch, you’re probably wondering what I thought of the experience. You’re not? Well, I’m going to go ahead and tell you anyways. Yooka Laylee was created by Playtonic Games, a studio featuring numerous veterans of the development studio known as Rare. If you don’t know who Rare is, you’re not a real 90s kid and don’t deserve to keep reading this. Rare is one of the most classic game companies of all time, responsible for such amazing hits as Donkey Kong Country, Conker’s Bad Fur Day, Battletoads, Perfect Dark, and much more. They also created Banjo Kazooie, your typical game featuring a bear carrying around a bird in its backpack trying to save his sister from a witch that’s trying to steal her beauty. It made much more sense in 1998. 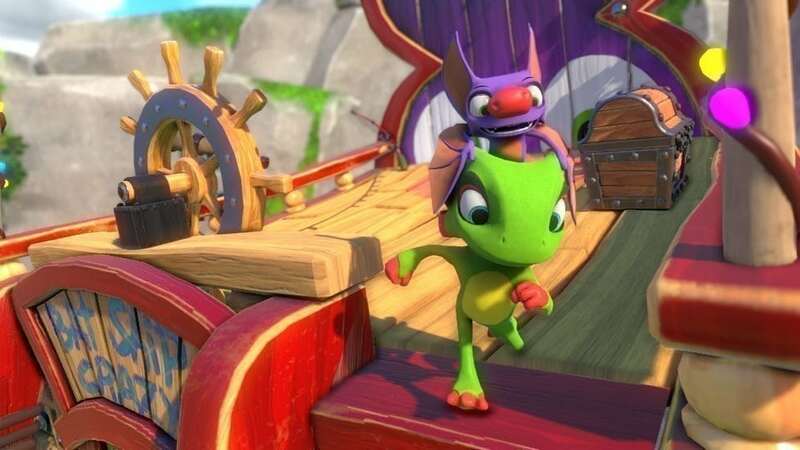 Funded on Kickstarter, Yooka-Laylee seems exactly like if Banjo Kazooie was developed for the modern age. It features all the quirky dialogue and cartoonish designs of the 90s hit but with enough modern flair to make it seem more like an evolution of the collect-a-thon platformer genre than a simple rehash of it. The music, composed by Rare veterans Grant Kirkhope and David Wise, fits perfectly with the style and gameplay. Characters are fun and enjoyable, including the bantering protagonists Yooka and Laylee, the arcade-obsessed dinosaur Rextro, and the pants-wearing snake known as Trowzer. Wait a second. Snake… Trowzer… Nahh, I don’t get it. If you liked classic cartoonish platformers like Banjo Kazooie and Conker’s Bad Fur Day, you’ll definitely enjoy Yooka-Laylee. And, even if you don’t have nostalgia of playing those classic platformers while eating Fruit Roll Ups and drinking Sunny D without a care in the world, you’ll likely find enjoyment experiencing the genre for the first time. But it definitely is best enjoyed with Fruit Roll Ups and Sunny D.